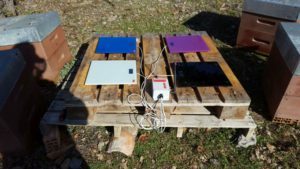 Place the four hive scale-plates on the pallet. Make sure that all four stems of the scale-plate are on a perfectly even surface). Take care to differentiate between P1, P2, P3 and P4. 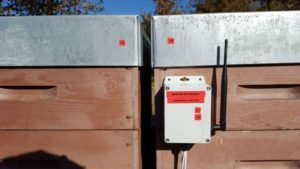 If the bottom of your hives is made of plastic (such as Nicot type), you will need to install an adaptor (the hive scale-plates measure 30×30 and are therefore adapted either to small hives such as Warre types or larger hives with a solid wooden base. 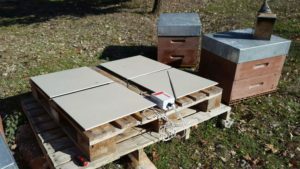 If the hive base is flexible, you will need to add a 45×45 tile as reinforcement). You will also need to place a tile under the plate to obtain a better signal. 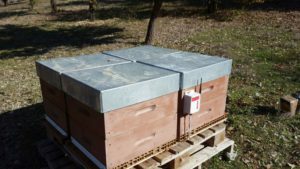 Attach the enclosure to the side of the hive (the temperature sensor is inside the enclosure; it has to be protected from the sun to avoid overheating). Number the hives from P1 to P4 according to the numbers of the scale-plates under each colony.